2 Do your work for six days, but the seventh day should be holy to you, a Sabbath of complete rest for the Lord. Whoever does any work on the Sabbath will be put to death.3 Don’t start a fire in any of your homes on the Sabbath day. 4 Moses said to the whole Israelite community, This is what the Lord has commanded:5 Collect gift offerings for the Lord from all of you. Whoever freely wants to give should bring the Lord’s gift offerings: gold, silver, and copper; 6 blue, purple, and deep red yarns; fine linen; goats’ hair; 7 rams’ skins dyed red; beaded leather; acacia wood; 8 the oil for the light; spices for the anointing oil and for the sweet-smelling incense; 9 gemstones; and gems for setting in the priest’s vest and in the priest’s chest pendant. 10 All of you who are skilled in crafts should come forward and make everything that the Lord has commanded: 11 the dwelling, its tent and its covering, its clasps, its boards, its bars, its posts, and its bases, 12 the chest with its poles and its cover, the veil for a screen,13 the table with its poles and all its equipment, the bread of the presence, 14 the lampstand for light with its equipment and its lamps, the oil for the light, 15 the incense altar with its poles, the anointing oil and the sweet-smelling incense, the entrance screen for the dwelling’s entrance, 16 the altar for entirely burned offerings with its copper grate, its poles, and all its equipment, the washbasin with its stand, 17 the courtyard’s drapes, its posts, and its bases, and the screen for the courtyard gate, 18 the dwelling’s tent pegs and the courtyard’s tent pegs, and their cords, 19 the woven clothing for ministering in the sanctuary, and the holy clothes for Aaron the priest and his sons for their service as priests. 20 The whole Israelite community left Moses. 21 Everyone who was excited and eager to participate brought the Lord’s gift offerings to be used for building the meeting tent and all its furnishings and for the holy clothes. 22 Both men and women came forward. Everyone who was eager to participate brought pins, earrings, rings, and necklaces, all sorts of gold objects. Everyone raised an uplifted offering of gold to the Lord. 23 And everyone who had blue or purple or deep red yarn or fine linen or goats’ hair or rams’ skins dyed red or beaded leather brought them. 24 Everyone who could make a gift offering of silver or copper brought it as the Lord’s gift offering. Everyone who had acacia wood that could be used in any kind of building work brought it. 25 All the skilled women spun cloth with their hands, and brought what they had spun in blue and purple and deep red yarns and fine linen. 26 All the women who were eager to use their skill spun the goats’ hair. 27 The chiefs brought gemstones and gems to be set in the priest’s vest and the chest pendant,28 spices and oil for light and for the anointing oil, and for the sweet-smelling incense.29 All the Israelite men and women who were eager to contribute something for the work that the Lord had commanded Moses to do brought it as a spontaneous gift to the Lord. 30 Then Moses said to the Israelites: “Look, the Lord has chosen Bezalel, Uri’s son and Hur’s grandson from the tribe of Judah. 31 The Lord has filled him with the divine spirit that will give him skill, ability, and knowledge for every kind of work. 32 He will be able to create designs, do metalwork in gold, silver, and copper, 33 cut stones for setting, carve wood, do every kind of creative work, 34 and have the ability to teach others. Both he and Oholiab, Ahisamach’s son from the tribe of Dan, 35 have been given the skill to do every kind of work done by a gem cutter or a designer or a needleworker in blue, purple, and deep red yarns and in fine linen or a weaver or anyone else doing work or creating designs. 2 Moses then called together Bezalel, Oholiab, and every skilled person whom the Lord had given skill and who was eager to come and do the work. 3 Moses gave them all the gift offerings that the Israelites had contributed to the work on the sanctuary. They kept bringing him spontaneous gifts, morning after morning. 6 So Moses issued a command that was proclaimed throughout the camp: “Every man and woman should stop making gift offerings for the sanctuary project.” So the people stopped bringing anything more 7 because what they had already brought was more than enough to do all the work. 8 All the skilled workers made the dwelling out of ten curtains of fine twisted linen and blue, purple, and deep red yarns, with figures of winged heavenly creatures worked into their design. 9 Each curtain was forty-two feet long and six feet wide. All the curtains were the same size. 10 They joined five of the curtains to each other and joined the other five curtains to each other. 11 They made loops of blue thread on the edge of the outer curtain of the first set. They did the same on the edge of the outer curtain of the second set. 12 They made fifty loops on the one curtain and fifty loops on the outer curtain that was in the second set. The loops were opposite each other. 13 They also made fifty gold clasps, and they used the clasps to join the curtains to each other so that the dwelling was one whole structure. 14 They also made curtains of goats’ hair for a tent over the dwelling. They made eleven curtains. 15 Each curtain was forty-five feet long and each curtain six feet wide. All eleven curtains were the same size. 16 They joined five curtains together and the six other curtains together. 17 They made fifty loops on the edge of the outer curtain of the one set and fifty loops on the edge of the other set of curtains. 18 They made fifty copper clasps to join the tent together so that it would be one whole structure. 19 They also made a covering for the tent of rams’ skins dyed red and an outer covering of beaded leather. 20 Then they made acacia-wood boards to stand upright as a frame for the dwelling. 21 Each board was fifteen feet long and twenty-seven inches wide. 22 Each board had two pegs for joining them to each other. They did this for all the dwelling’s boards. 23 They made twenty boards for the dwelling’s southern side. 24 They made forty silver bases under the twenty boards, with two bases under the first board for its two pegs, two bases under the next board for its two pegs, and so on. 25 For the dwelling’s other side on the north, they made twenty boards 26 and forty silver bases, two bases under the first board, two bases under the next board, and so on. 27 For the back of the dwelling on the west, they made six boards. 28 They made two additional boards for the dwelling’s rear corners.29 They were spread out at the bottom but joined together at the top with one ring. In this way, these two boards formed the two corners. 30 And so there were eight boards with their sixteen silver bases, with two bases under every board. 31 They also made acacia-wood bars: five for the boards on one side of the dwelling, 32 five bars for the boards on the other side of the dwelling, and five bars for the boards on the back wall of the dwelling on the west. 33 They made the middle bar, which was halfway up the boards, run from one end to the other. 34 They covered the boards with gold. They made gold rings to house the bars and covered the bars with gold. 35 They made the veil of blue, purple, and deep red yarns and fine twisted linen, with figures of winged heavenly creatures worked into its design. 36 They made for it four acacia-wood posts covered in gold with gold hooks and cast four silver bases for them.37 They made a screen for the entrance to the tent of blue, purple, and deep red yarns and fine twisted linen, decorated with needlework. 38 They made its five posts with hooks. They covered their tops and bands with gold, but made their five bases out of copper. 1 Bezalel made the chest of acacia wood. It was forty-five inches long, twenty-seven inches wide, and twenty-seven inches high. 2 He covered the chest with pure gold inside and out, and made a gold molding all around it. 3 He cast four gold rings for it and put them on its four feet, two rings on one side and two rings on the other. 4 He made acacia-wood poles and covered them with gold. 5 He put the poles into the rings on the chest’s sides to use to carry the chest. 6 He made a cover for the chest out of pure gold, forty-five inches long and twenty-seven inches wide. 7 He made two winged heavenly creatures of hammered gold for the two ends of the cover, 8 one winged heavenly creature at one end and one winged heavenly creature at the other. He placed the winged heavenly creatures at the cover’s two ends. 9 The winged heavenly creatures spread out their wings above, shielding the cover with their wings. The winged heavenly creatures faced each other toward the cover’s center. 10 He also made the table of acacia wood, three feet long, eighteen inches wide, and twenty-seven inches high. 11 He covered it with pure gold and made a gold molding all around it. 12 He made a frame around it that was four inches wide and gold molding around the frame. 13 He made four gold rings for the table. He fastened the rings to the four corners at its four legs. 14 The rings that housed the poles used for carrying the table were close to the frame. 15 He made the poles used to carry the table out of acacia wood, and he covered them with gold. 16 He made the containers of pure gold that were to be on the table: its plates, dishes, bowls, and jars for pouring drink offerings. 17 He also made the lampstand of pure, hammered gold. The lampstand’s base, branches, cups, flowers, and petals were all attached to it. 18 It had six branches growing out from its sides, three branches on one side of the lampstand and three branches on the other side of the lampstand. 19 One branch had three cups shaped like almond blossoms, each with a flower and petals, and the next branch also had three cups shaped like almond blossoms, each with a flower and petals. A total of six branches grew out of the lampstand. 20 In addition, on the lampstand itself there were four cups shaped like almond blossoms, each with its flower and petals. 21 There was a flower attached under the first pair of branches, a flower attached under the next pair of branches, and a flower attached under the last pair of branches. 22 Their flowers and their branches were attached to it. The whole lampstand was one piece of pure hammered gold. 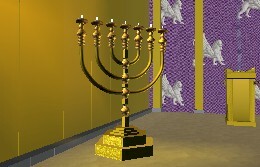 23 He made its seven lamps and its tongs and its fire pans out of pure gold. 24 He made the lampstand and all its equipment from pure gold weighing one kikkar. 25 He made the incense altar out of acacia wood. The altar was square, eighteen inches long by eighteen inches wide. It was three feet high, and its horns were permanently attached. 26 He covered it with pure gold, including its top, all its sides, and its horns. He also made a gold molding all around it. 27 He made two gold rings, and he attached them under the molding on two opposite sides of the altar. They housed the poles used to carry it. 28 He made the poles of acacia wood, and he covered them with gold. 29 He also made the holy anointing oil and the pure sweet-smelling incense like a skilled perfume maker. 1 He made the altar for entirely burned offerings out of acacia wood. The altar was square, seven and a half feet long and seven and a half feet wide. It was four and a half feet high. 2 He made horns for it, one horn on each of its four corners. Its horns were attached to the altar, and he covered it with copper. 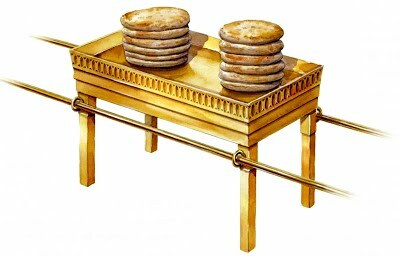 3 He made all the altar’s equipment: the pails, the shovels, the bowls, the meat forks, and the trays. He made all its equipment out of copper. 4 He made a grate for the altar of copper mesh underneath its bottom edge and extending halfway up to the middle of the altar. 5 He made four rings for each of the four corners of the copper grate to house the poles. 6 He made the poles out of acacia wood, and he covered them with copper. 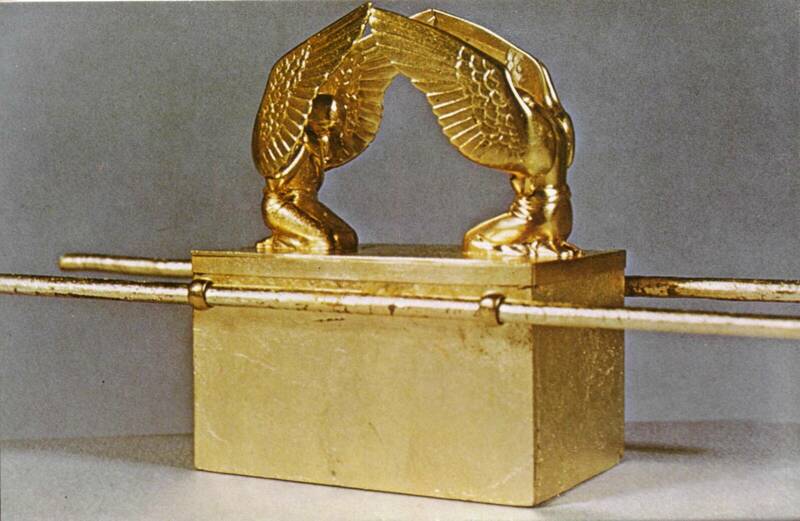 7 He put the poles through the rings so that the poles were on the two sides of the altar when it was carried. He made the altar with planks but hollow inside. 8 He made the copper washbasin with its copper stand from the copper mirrors among the ranks of women assigned to the meeting tent’s entrance. 9 He also set up the courtyard. The courtyard’s south side had drapes of fine twisted linen stretching one hundred fifty feet 10 with twenty posts, twenty copper bases, and silver hooks and bands for the posts. 11 Likewise the north side stretched one hundred fifty feet, with twenty posts, twenty copper bases, and silver hooks and bands for the posts. 12 On the west side the drapes stretched seventy-five feet, with their ten posts, their ten bases, and silver hooks and bands for the posts. 13 The front side facing east was seventy-five feet. 14 There were twenty-two and a half feet of drapes on one side with three posts and three bases for them. 15 Likewise, there were twenty-two and a half feet of drapes on the other side of the plaza’s gate with three posts and three bases for them. 16 All the drapes around the courtyard were made of fine twisted linen. 17 The bases for the posts were made of copper, but the hooks for the posts and their bands were made of silver. The tops of the posts were covered with silver, and all the posts surrounding the courtyard had silver bands. 18 The screen for the gate into the courtyard was made with blue, purple, and deep red yarns and fine twisted linen, decorated with needlework. It was thirty feet long and, along the width of it, seven and a half feet high, corresponding to the courtyard’s drapes. 19 It had four posts, their four copper bases, their silver hooks, and their tops and bands covered with silver. 20 All the tent pegs for the dwelling and for the courtyard all around were made of copper. 21 These are the accounts of the dwelling, the covenant dwelling, that were recorded at Moses’ instructions. They are the work of the Levites, under the direction of Ithamar, Aaron the priest’s son. 22 Bezalel, Uri’s son and Hur’s grandson from the tribe of Judah, made everything that the Lord had commanded Moses to make. 23 Working with Bezalel was Oholiab, Ahisamach’s son from the tribe of Dan, who was a gem cutter, a designer, and a needleworker in blue, purple, and deep red yarns and in fine linen. 24 The total amount of the gold that was used for construction of the whole sanctuary, gold from the uplifted offerings, was twenty-nine kikkars and seven hundred thirty shekels in weight, measured by the sanctuary shekel. 25 The silver from the community census totaled one hundred kikkars and one thousand seven hundred seventy-five shekels in weight, measured by the sanctuary shekel. 26 They gave a beqa per person (that is, half a shekel, measured by the sanctuary shekel) for everyone who was counted in the census, 20 years old and above, 603,550 men. 27 One hundred kikkars of silver were used to cast the bases for the sanctuary and the bases for the veil, one hundred bases from one hundred kikkars of silver, one kikkar for every base. 28 He used one thousand seven hundred seventy-five shekels of silver to make the hooks for the posts, cover their tops, and make bands for them. 29 The amount of copper from the uplifted offering was seventy kikkars and two thousand four hundred shekels in weight. 30 He used it to make the bases for the meeting tent’s entrance, the copper altar, its copper grate, and all the altar’s equipment, 31 the bases all around the courtyard, and the bases for the courtyard’s gate, all the dwelling’s tent pegs, and all the tent pegs used around the courtyard. 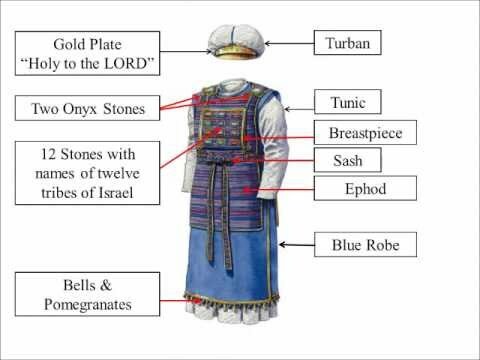 1 They used the blue, purple, and deep red yarns to make the woven clothing for those ministering as priests in the sanctuary. They made the holy clothes for Aaron as the Lordhad commanded Moses. 2 They made the vest of gold, of blue, purple, and deep red yarns, and of fine twisted linen. 3 They beat out thin sheets of gold and cut them into threads to work into designs among the blue, purple, and deep red yarns and the fine linen. 4 They made shoulder pieces for it attached to its two edges so that they could be joined together. 5 The vest’s belt was attached to it and made in the same way of gold, of blue, purple, and deep red yarns, and of fine twisted linen, just as the Lord had commanded Moses. 6 They prepared the gemstones by mounting them in gold settings and engraving on them the names of Israel’s sons, like an official seal is engraved. 7 The stones were attached to the vest’s shoulder pieces as reminder stones for the Israelites, just as the Lord had commanded Moses. 8 They made the embroidered chest pendant in the style of the vest, using gold, blue, purple, and deep red yarns, and fine twisted linen. 9 They made the chest pendant square and doubled, nine inches long and nine inches wide when doubled. 10 They set in it four rows of gemstones. The first row was a row of carnelian, topaz, and emerald stones.11 The second row was a turquoise, a sapphire, and a moonstone. 12 The third row was a jacinth, an agate, and an amethyst. 13 The fourth row was a beryl, an onyx, and a jasper. The settings around them were decorative gold. 14 There were twelve stones with names corresponding to the names of Israel’s sons. They were engraved like official seals, each with its name for the twelve tribes. 15 They made chains of pure gold, twisted like cords, for the chest pendant. 16 They made two gold settings and two gold rings. They attached the two rings to the two edges of the chest pendant. 17 They attached the two gold cords to the two rings at the edges of the chest pendant. 18 Then they fastened the two ends of the two cords to the two gold settings and attached them to the front of the vest’s shoulder pieces. 19 They made two gold rings, and they attached them to the two edges of the chest pendant, on its inside edge facing the vest. 20 They made two gold rings and fastened them on the front of the lower part of the two shoulder pieces of the vest, at its seam just above the vest’s belt. 21 The chest pendant was held in place by a blue cord binding its rings to the vest’s rings so that the chest pendant rested on the vest’s belt and didn’t come loose from the vest, just as the Lord had commanded Moses. 22 They also made the vest’s robe, woven completely in blue. 23 The opening of the robe in the middle of it was reinforced with a strong border so that it didn’t tear. 24 On the robe’s lower hem, they added pomegranates made of blue, purple, and deep red yarns and of fine twisted linen. 25 They also made pure gold bells and sewed the bells between the pomegranates, all around the robe’s lower hem, 26 with a bell and a pomegranate alternating all around the lower hem of the robe that is used for ministering as a priest, just as the Lord had commanded Moses. 27 They also made the tunics woven out of fine linen for Aaron and his sons, 28 the turban of fine linen, the decorated turbans of fine linen, the linen undergarments of fine twisted linen, 29 the sashes of fine twisted linen, and of blue, purple, and crimson yarns, decorated with needlework, just as the Lord had commanded Moses. 30 They made the flower ornament for the holy crown out of pure gold. Like the engraving on an official seal, they engraved on it the saying “Holy to the Lord.” 31 They fastened to it a blue cord to tie it to the top of the turban, just as the Lord had commanded Moses. 41 the woven clothes for ministering as priests in the sanctuary, the holy clothes for the priest Aaron and the clothes for his sons to serve as priests. 42 The Israelites did all of the work just as the Lord had commanded Moses. 43 When Moses saw that they in fact had done all the work exactly as the Lord had commanded, Moses blessed them. 1 The Lord spoke to Moses: 2 Set up the meeting tent dwelling on the first day of the first month. 3 Place the chest containing the covenant inside the dwelling. Hide the chest from view with the veil. 4 Bring in the table and arrange its items. Bring in the lampstand and set up its lamps. 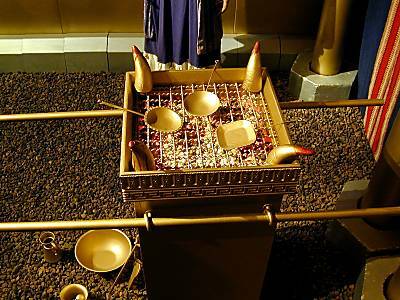 5 Place the gold altar for burning incense in front of the chest containing the covenant. Set up the screen at the dwelling’s entrance. 6 Put the altar for entirely burned offerings in front of the entrance to the meeting tent dwelling. 7 Put the washbasin between the meeting tent and the altar and put water in it. 8 Set up the courtyard all around. Hang up the screen at the courtyard gate. 9 Then take the anointing oil and anoint the dwelling and everything in it. Make holy the dwelling and all its equipment, and it will be holy. 10 Anoint the altar for entirely burned offerings and all its equipment. Make the altar holy, and the altar will be most holy. 11 Anoint the washbasin with its stand and make it holy. 12 Then bring Aaron and his sons to the meeting tent’s entrance and wash them with water. 13 Dress Aaron in the holy clothes. Anoint him and make him holy so that he may serve me as priest. 14 Then bring his sons and dress them in tunics. 15 Anoint them like you anointed their father so that they may serve me as priests. Their anointing is to the priesthood for all time in every generation. 16 Moses did everything exactly as the Lord had commanded him. 17 In the first month in the second year, on the first day of the month, the dwelling was set up. 18 Moses set up the dwelling. He laid out its bases. He set up its boards, inserted its bars, and raised up its posts. 19 He spread the tent out over the dwelling, and he put the covering of the tent over it, just as the Lord had commanded Moses. 20 He took the covenant document and placed it inside the chest. He put the poles on the chest, and he set the cover on top of the chest. 21 He brought the chest into the dwelling. 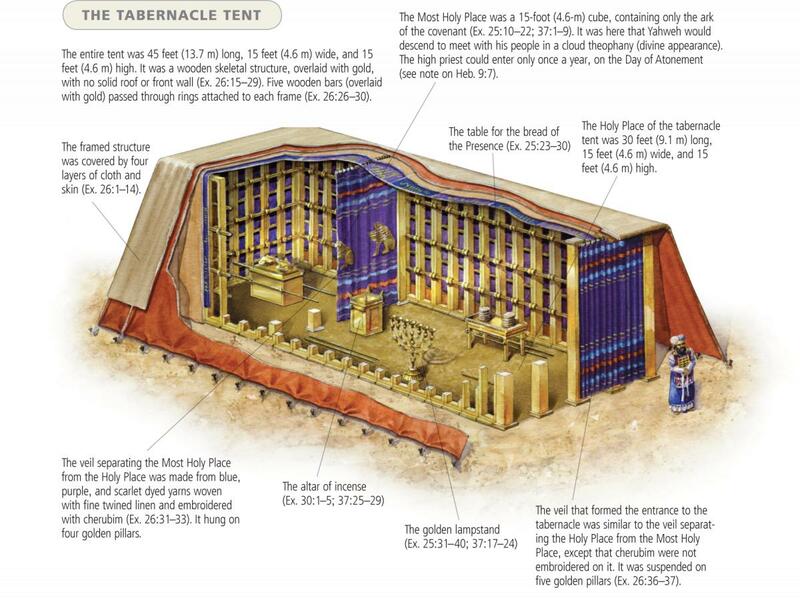 He set up the veil as a screen to hide from view the chest containing the covenant, just as the Lord had commanded Moses.22 He placed the table in the meeting tent, on the north side of the dwelling, outside the veil. 23 He set the bread in its proper place on the table in the Lord’s presence, just as the Lord had commanded Moses. 24 He put the lampstand in the meeting tent, opposite the table on the south side of the dwelling. 25 He set up the lamps in the Lord’s presence, just as the Lord had commanded Moses. 26 He put the gold altar in the meeting tent in front of the veil. 27 He burned sweet-smelling incense on it, just as the Lord had commanded Moses. 28 He also set up the screen at the entrance to the dwelling. 29 He placed the altar for entirely burned offerings at the entrance to the meeting tent dwelling. He offered the entirely burned offering and the grain offering on it, just as the Lord had commanded Moses. 30 He put the washbasin between the meeting tent and the altar, and put water in it for washing. 31 Moses, Aaron, and his sons used it to wash their hands and their feet.32 Whenever they went into the meeting tent and whenever they approached the altar, they washed themselves, just as the Lord had commanded Moses. 33 He set up the courtyard around the dwelling and the altar, and he hung up the screen at the courtyard’s gate. When Moses had finished all the work, 34 the cloud covered the meeting tent and the Lord’s glorious presence filled the dwelling. 35 Moses couldn’t enter the meeting tent because the cloud had settled on it, and the Lord’s glorious presence filled the dwelling.36 Whenever the cloud rose from the dwelling, the Israelites would set out on their journeys. 37 But if the cloud didn’t rise, then they didn’t set out until the day it rose. 38 The Lord’s cloud stayed over the dwelling during the day, with lightning in it at night, clearly visible to the whole household of Israel at every stage of their journey.